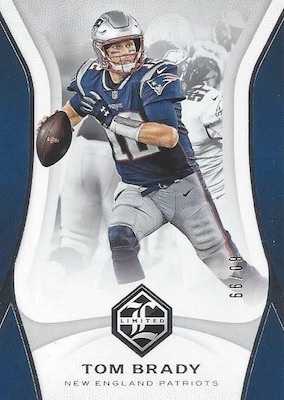 Established card brand names don't get more generic than Limited NFL, but 2018 Panini Limited Football still rocks the gridiron for another season. Each Hobby box has one hard-signed rookie patch autograph, one additional autogrpah, and one memorabilia card. While much of the release mirrors the 2017 set, Hobby case sizes drop down from 15 to 14 boxes. 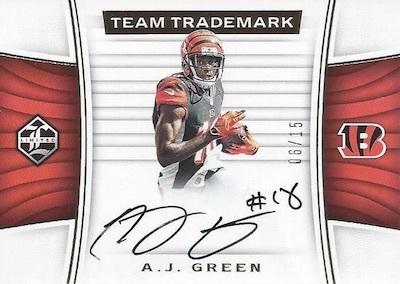 Filling out a majority of the box content, the base set for 2018 Panini Limited Football keeps to the brand's style without outright duplicating last year's look. The 100-card set also comes in Spotlight parallels: Silver (#/99), Gold (#/49), Ruby (#/25), Amethyst (#/10), Emerald (#/5), and Sapphire (1/1). Helping entice collectors, the 2018 Panini Limited Football checklist combines to provide two autographs per Hobby box. One of these should be an on-card Rookie Patch Autograph card numbered to 299 or less. Spotlight parallels include Silver (#/75), Gold (#/50), Ruby (#/10), Emerald (#/5), and Sapphire (1/1). There are also Variation RPA versions, numbered to 199 or less, with the same Spotlight parallels but print runs no higher than 25. Rookies give way to veterans and retired players in Ring of Honor (#/99 or less) and Unlimited Signatures (#/99 or less). In addition, multi-player inserts include Dual Patch Auto Combos (#/50 or less), plus team-based Partnership Duals, Partnership Trios (#/50 or less), and Six Star Signature Booklet (#/25 or less). Most autograph lines add various Spotlight parallels, as well. The Draft Day Booklet (#/55 or less) set revisits the place where it all began for many young stars. Each horizontal book card includes an autograph and a piece from the jersey displayed during the big moment onstage with Roger Goodell at the 2018 NFL Draft. Bringing the product to a close, 2018 Panini Limited Football offers one relic per box. Among the choices, Rookie Phenoms goes jumbo with the memorabilia swatch, adding Silver (#/75), Gold (#/50), Ruby (#/10), Emerald (#/5), and Sapphire (1/1) Spotlight parallels. SPOTLIGHT PARALLELS: Silver #/99, Gold #/49, Ruby #/25, Amethyst #/10, Emerald #/5, Sapphire 1/1, Printing Plates 1/1. SPOTLIGHT PARALLELS: Silver #/25, Gold #/20, Ruby #/10, Emerald #/5, Sapphire 1/1. SPOTLIGHT PARALLELS: Gold #/50 or less, Ruby #/25 or less, Sapphire 1/1. Buy 2018 Limited NFL autographs on eBay. 17 cards. Serial numbered #/55. PARALLEL CARDS: Sapphire Swoosh 1/1. SPOTLIGHT PARALLELS: Gold #/25 or less, Ruby #/10 or #/5, Sapphire 1/1. SPOTLIGHT PARALLELS: Gold #/50 or less, Ruby #/10 or less, Sapphire 1/1. SPOTLIGHT PARALLELS: Gold #/25 or less, Ruby #/10 or less, Sapphire 1/1. SPOTLIGHT PARALLELS: Silver #/35 or less, Gold #/25 or less, Emerald #/5 or #/3, Sapphire 1/1. 7 cards. Serial numbered #/3. SPOTLIGHT PARALLELS: Gold #/25 or less, Emerald #/5 or #/3, Sapphire 1/1. 8 cards, including 3 Silver and 5 Ruby parallels. 10 cards. Serial numbered #/65. SPOTLIGHT PARALLELS: Silver #/50, Gold #/20, Ruby #/10, Sapphire 1/1. SPOTLIGHT PARALLELS: Silver #/75, Gold #/50, Ruby #/10, Sapphire 1/1. View the 2018 Limited Football checklist spreadsheet. 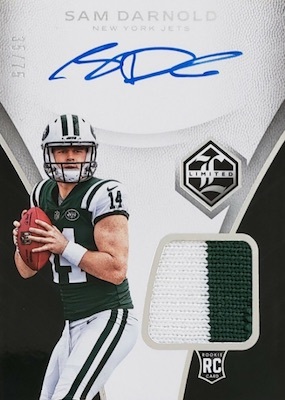 normally the insert auto sets are reserved for star players or the rookies everyone wants in additional quantities..
clearly this product has become a signature dump except for the patch rookies which are hard signed..
too bad they doubled the production with un-necessary not wanted variations..
guess not so much anymore.. So Panini just reuses the same image over and over again for all its base cards? The Edelman image here was used for Luminance and Certified too. They did the same thing with Kirk Cousins this year. That’s embarrassing. I’m done. Bought a box today and pulled my first ever kicker auto and it was a one of one(Jake Elliott). I wasn’t even made, I like it. 2018 Panini Limited Football Hobby Box - Factory Sealed!